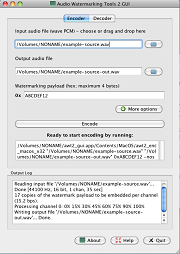 Audio Watermarking Tools 2 (AWT2) is flagship solution in the AWT products family. 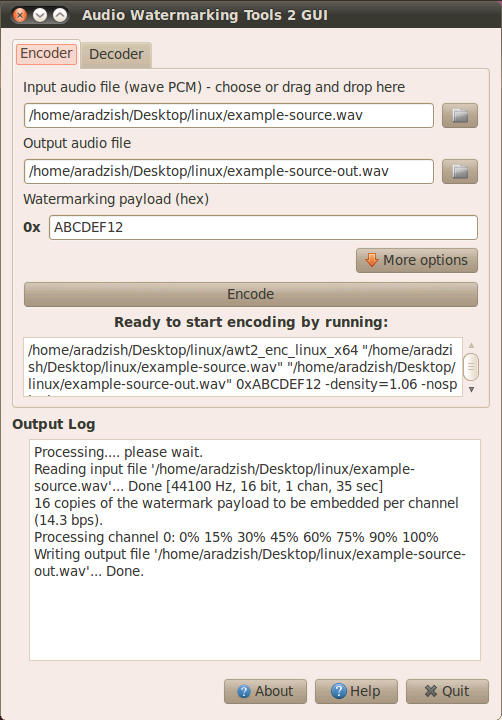 AWT2 a set of software utilities for embedding (and retrieving) digital watermarks carrying arbitrary digital data within (from) audio files and streams. AWT2 uses proprietary patented* technology to imperceptibly embed watermarks directly into the audio content so that they cannot be removed without damaging the original audio quality. The tools are distributed as a package of GUI and console utilities running on Microsoft Windows 7/Vista/XP/NT/2000/Server, Apple Mac OS X and Linux/*nix Intel and ARM systems. AWT2 SDK is available for all major desktop and mobile platforms. 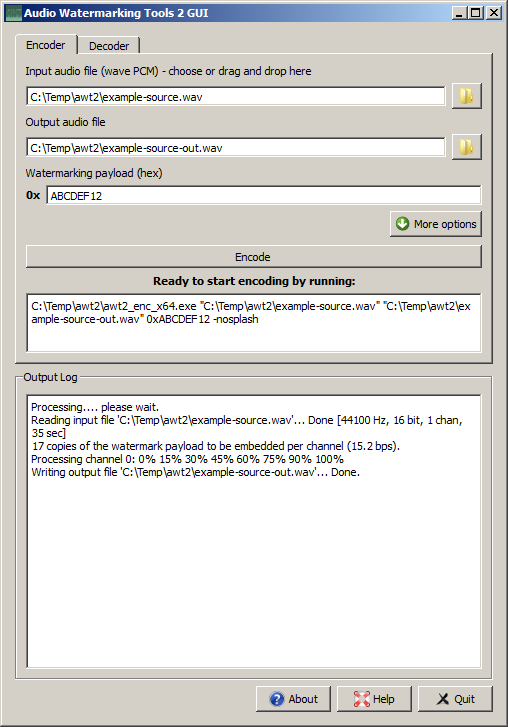 AWT2 implements so called "blind watermarking" approach in the sense that the watermark can be extracted directly from the watermarked audio recording (so that the source audio is not needed). AWT2 watermarks are inaudible and highly robust, surviving low bitrate transcoding with lossy coders, mixing, effect processing, acoustic coupling (transducing via air) and time stretching. Check examples section. AWT2 offers unprecedentedly high watermarking data rate up to 125 bps (i.e. 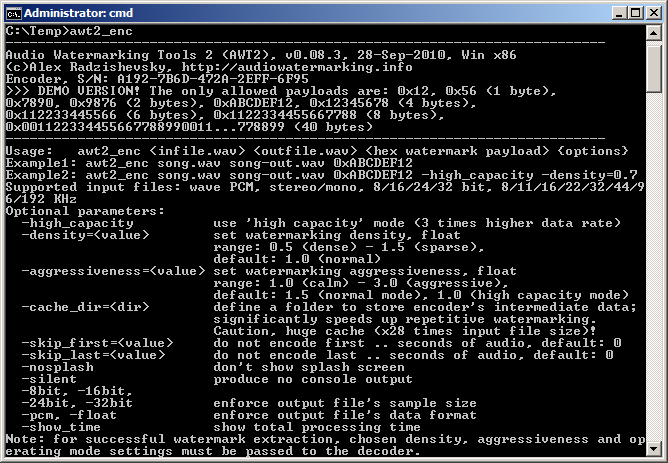 more than 16 bytes in one second of audio); watermark payloads up to 120 bytes long are supported. AWT2 brings reliable watermarking to your business. AWT2 protects your rights by ensuring that your watermark is detectable (only by you!) in any copy of your audio materials transmitted or broadcasted anywhere. You can request AWT2 evaluation package here. This software is offered "as is". Please try and buy. AWT2 GUI tool is available for Microsoft Windows, Apple Mac OS X and Linux (Gentoo, OpenSuse, Ubuntu) platforms. It comes with drag'n'drop support. 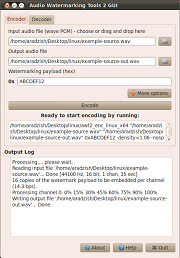 Console AWT2 encoder and decoder are available for Windows, Mac OS X, Linux and FreeBSD. Other platforms can be supported upon request. 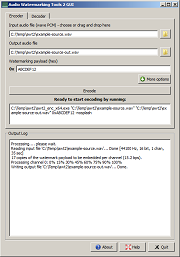 All packages contain encoder (demo version), decoder, GUI application, descriptive User Guide (PDF), example batch files. You may also want to look at the full changes log of AWT2 package releases. AWT2 can be compiled for any platform not listed above. If you are interested in integration of AWT2 into your software, you can use AWT2 SDK, which is available for all major desktop, server and mobile platforms upon request. 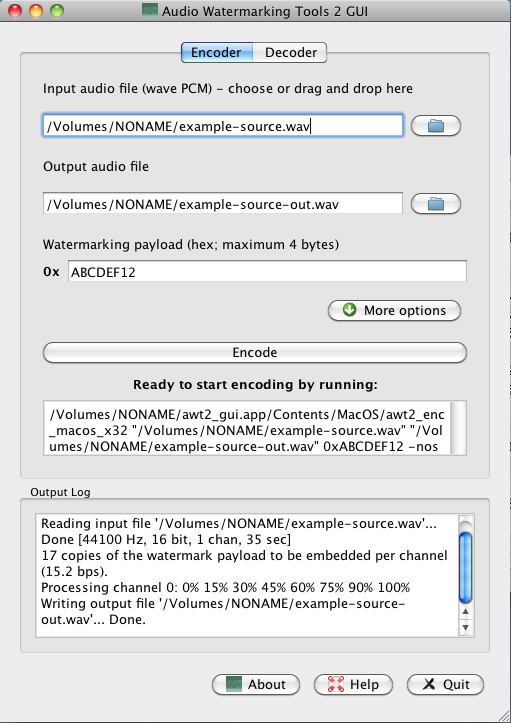 The demo version of the encoder has limited functionality: the only permitted watermarks that can be embedded into audio stream are: 0x12, 0x56 (1 byte), 0x7890, 0x9876 (2 bytes), 0xABCDEF12, 0x12345678 (4 bytes), 0x112233445566 (6 bytes), 0x1122334455667788 (8 bytes) and 0x001122334455667788990011...8899 (40 bytes). This is quite strict limitation, however it offers enough flexibility to perform a variety of performance tests so that you can decide whether AWT2 suits your needs or not before buying fully functional version. If this limitation seems to you too strict and you wish to test the package with other watermarks, please feel free to contact AWT2 author by e-mail.